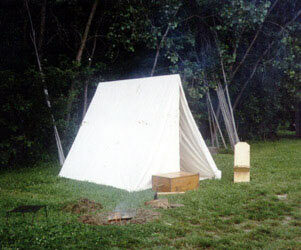 We make all types of tents for buckskinners, mountain men, and other living history reenactors who recreate the the time period before 1840. All of our tents are available in four types of canvas and are backed by our world famous guarantee. We offer 13 sizes to chose from. These range from 8'x8' to 14'x18' and make popular quarters because of their headroom. 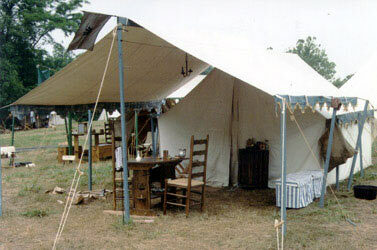 Other sizes are available in our Military Tents section. This large tent is used for dealer stores as well as fancy residential units. The 6' to 7' high sidewalls mean you get more headroom than with any other tent. Panther offers 33 standard square or rectangular sizes and 13 standard oval sizes. Many options are available. Our multi-purpose diamond shelters come in 4 sizes ranging from 10'x10' to 16'x16'. These handy shelters can be set up in various ways, even as a dining fly. We also offer 3 sizes in our brown oilskin material. You may choose from 7 basic sizes and a variety of options for each size. 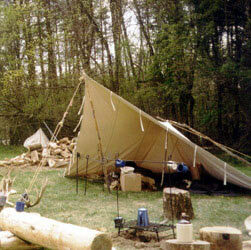 The wedge tent is very easy to put up (only 3 poles needed) which makes it history's most popular tent. 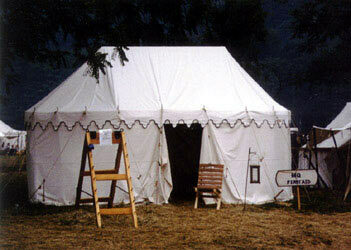 You can find 13 more sizes of wedge tents in our military tents section and 4 jumbo sizes in our medieval tents section. Copyright © 1999-2019 Panther Primitives. All rights reserved. Web site by Blue Cat Design. Web maintenance by Logical Operators, Inc.